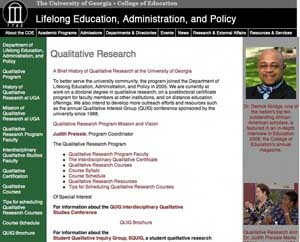 The Qualitative Research Program at the University of Georgia provides a graduate certificate in Interdisciplinary Qualitative Studies and an array of courses in qualitative research design, methods, and theory. For students seeking a doctoral concentration in qualitative research methods, we have typically collaborated with the College of Education’s Research, Evaluation, Measurement, and Statistics Program. However, students from across college and university programs have used the certificate program to build minor and cognate specialties in qualitative research. Our graduates conduct and teach research across areas in education, in clinical fields, and in other professional and social sciences. Some hold leadership positions in policy forums and in a variety of formal, nonformal, and informal educational arenas where their research skills promote institutional development and renewal. Beginning with one course and a single instructor in 1976, the program now has five full-time faculty lines and a steadily increasing number of affiliated faculty members from around the university. It is one of only two such certificate programs worldwide devoted exclusively to qualitative research. Faculty members practice and study the range of traditions associated with qualitative research: interpretive study, historical study, sociocultural research, emancipatory traditions, evaluation research, and postmodern and poststructural traditions. The mission of the Qualitative Research Program is to foster scholarship in research design and prepare qualitative research methodologists. Graduates from the Interdisciplinary Qualitative Studies Certificate program have the knowledge and skills to design, critique, and implement high quality research and evaluation studies. Our program advances the field of interdisciplinary qualitative research design and methods, such as ethnography, historical methods, ethnomethodological analysis of texts and talk-in-interaction, narrative methods, hermeneutics, case study, poststructural approaches, arts-based inquiry, and participatory action research. We prepare exceptional teachers of theoretically grounded research design for academic positions as well as researchers for other institutions and agencies. We provide coursework and mentoring for students across the university who apply qualitative and multimethods research in their fields. The program is a center of global outreach for scholarship and pedagogy in qualitative design and evaluation. We aspire to be the foremost center for interdisciplinary qualitative research design in the world.